Follow my adventures from a research trip to London! On one of the tours I took of the many fabulous buildings London has to offer, I heard a tour guide quote Samuel Johnson. "Why, Sir, you find no man, at all intellectual, who is willing to leave London. No, Sir, when a man is tired of London, he is tired of life; for there is in London all that life can afford." After two weeks here, I don't know if I have ever heard truer words. London has offered me so much. I learned great things through my research for my class, I learned things about myself (like the fact I can fearlessly ride the subway alone without getting hopelessly lost), and I learned about the great history of this beautiful city. I've finished my research project, and I'm preparing for my last day here. I've seen everything I wanted to see most, but in London, there is always something else to see and do. I will never forget this experience. I don't want to waste any of my final hours here, so instead of a lengthy summary of my research, I will leave you with a link to my final paper. I've been hoofing it all over London, trying to get in everything on my Top Ten List. My legs are tired and my feet are sore, but I've almost seen everything I wanted to see! I've had the opportunity to interview two people so far for my research in London. I've learned that, although we speak the same language, our cultures are very different. By extension, social media habits are also different. I spoke to Maria Surcel, the Digital Marketing Coordinator for Ronald McDonald House Charities U.K. In my interview with her, I found a huge difference between the RMHC branding here in the U.K. versus in the U.S. In the U.K., the role of Ronald McDonald, RMHC's clown mascot, is downplayed. Surcel said that clowns simply aren't as popular in the the U.K. as they are in the U.S. Completely opposite of that, Laura Doyle, Communications Manager of the RMH of Cleveland, told me that some children are disappointed to arrive at the House only to find out that Ronald doesn't live there! Although Ronald plays less of a role in the U.K. branding, his hand is still visible in the logo. I'm finally in London with the rest of my class, and my first impressions of London are that it is huge, and clearly not laid out in a grid. That makes it a little confusing to find your way around, but I'm starting to get the hang of it. The Tube is a lot easier to manage than I anticipated, and I was really surprised by how quickly you can get from one end of the city to the other. 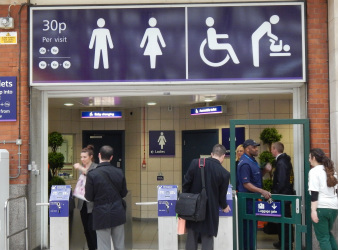 And I was not expecting to see people pay 30 pence to use the loo in the train station! I've been keeping busy with my U.S. research of Ronald McDonald House Charities! I interviewed Katie Underhill from the St. Louis Chapter, Laura Doyle from the Cleveland Chapter, Sarah Cockerill at the Global Office, as well as an outside Communication Consultant, Mark Nylander. So what have I learned so far for my Global Advertising and Public Relations class? RMHC has several different audience groups--families who are staying or have stayed in a House, volunteers, private donors, corporate donors, and potential donors. It sounds obvious to say that different social media strategies would be used to target different audiences, but what surprised me about my research is that RMHC Chapters see different audience groups across different social media platforms. Both Underhill and Doyle told me that they use Facebook to communicate with families, and they use Twitter to communicate with corporate donors and other organizations. In London, I Want to See it ALL! Jack the Ripper Walking Tour, Windsor Palace, The London Bridge Experience, The Globe Theater and all the other museums! I’ve really been enjoying my research for my Global Advertising and PR class! For my research of Ronald McDonald House Charities, I decided to “start at home.” For me that means St. Louis. In an earlier post, I told the story of my family’s stay at the Ronald McDonald House of St. Louis when I was a baby in the NICU. I had the opportunity to interview Katie Underhill, Communications Coordinator for Ronald McDonald House Charities of St. Louis. The St. Louis Chapter operates three Houses and three Family Rooms. 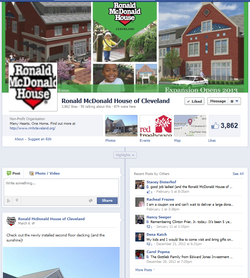 Underhill's primary focus when managing social media for RMHC of St. Louis is to raise awareness. Underhill said she uses Facebook to connect with families and volunteers, and she stressed how important it is to establish an emotional connection. Ronald McDonald House Charities has always held a special place in my heart, which is why I chose it as the subject of my research, comparing nonprofit social media use in the U.S. and the U.K.
On October 16, 1985, my parents visited Barnes-Jewish Hospital in St. Louis for scheduled procedures to monitor a high-risk pregnancy. Instead, I was delivered by emergency C-section that afternoon. Born at only 31 weeks, I weighed three and a half pounds. I was an “Rh baby”—my mom’s blood is negative, and mine is positive, causing her body to reject me. Within minutes of birth, I received the first of nine exchange blood transfusions to keep my high bilirubin levels from causing brain damage. 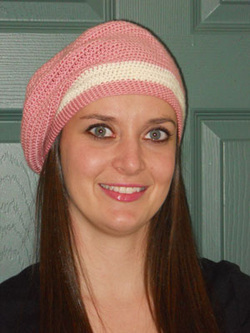 I'm Celeste Gossmann, and I'm a graduate student at Kent State University in Ohio, studying public relations. I'm open to a lot of career possibilities after I graduate in May, but my particular areas of interest are media relations and nonprofits. I'm from Marshall, Illinois. No, that's nowhere near Chicago. Marshall is a small rural town near the Indiana border on I-70. My favorite color is pink. I wear it almost every day, in some form or another. This semester at Kent State is particularly exciting for me as I prepare to visit London to conduct research as part of the Global Advertising and PR class at Kent State. Throughout the semester, and for two weeks in London, I will be comparing Ronald McDonald House Charities and its use of social media in both the US and the UK. Social media has made it so accessible for organizations to reach a global audience, and I'm looking forward to learning how such a large nonprofit is harnessing that power. I have been out of the country before, but only as far as Canada. I'm very excited about my first trip across the pond! What do I do with the rest of my time? Video editing is a hobby of mine. I love to do the kind of short, fast-to-produce videos that do so well on social media! You can see some of my work on this website, or you can visit my YouTube channel. I love crafts, especially crocheting (check out my craft blog), and I'm torn between wanting to crochet on the plane and not wanting to fill valuable souvenir space with yarn! 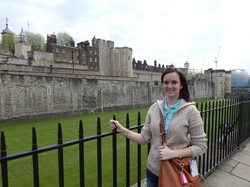 In May of 2013, I had the opportunity to participate in a research trip to London. I conducted research comparing how nonprofits use social media for public relations in the U.K. versus in the U.S. The entries in the blog contain my findings.